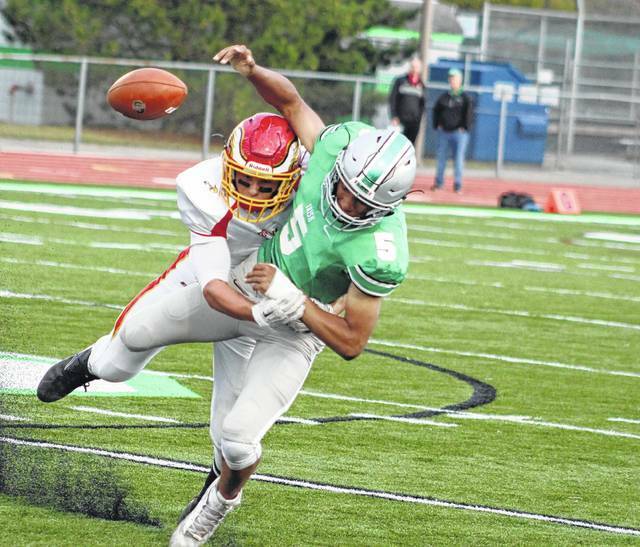 The Big Walnut football team turned the ball over four times in the first half and never recovered in Thursday night’s 51-21 non-league loss at Dublin Scioto. “We made way too many mistakes and you can’t make mistakes like that against a good football team,” BW coach Joe Weaver said. The Golden Eagles looked to make an impact early with an onside kick on the opening kickoff, but it went out of bounds. Four plays later, Scioto took a 7-0 lead on a Kenyon Pannell 13-yard touchdown with 11:06 left in the opening quarter to cap a 50-yard drive. The Irish never trailed. Demaine Barnett stepped in front of a Tyler Ronk pass and returned the interception 48 yards for a touchdown to push the Irish lead to 14-0 with 6:53 left in the first. Abe Myers got BW on the board with a 5-yard touchdown that took advantage of a failed onside kick attempt by Scioto. Ronk found Sam Elliott for 21 yards to set up the score. Pannell scored from 10 yards out to push the lead back to 14 early in the second frame. Sam Andoh recovered a fumble and returned it 18 yards to extend the lead to 27-7 with 10:17 left in the half. Jeremy Erickson’s fumble recovery turned into a Griffin Crosa 21-yard field goal to push it to 30-7 with 8:06 left in the half. Myers’ second touchdown came from 15 yards out with 0:39 left in the first half to cut the deficit to 30-14 at the break. Myers finished with 102 yards rushing on 22 carries and Ronk added 49 yards on the ground and 60 yards passing to lead the Eagles. All told, the teams combined for eight fumbles, six recovered by the other team, and an interception in the first half. Jaden Penn took a handoff on a reverse and tossed a 22-yard touchdown to Jacob Jones and Pannell added a 68-yard touchdown run for the Irish (1-2) in the third quarter. Penn also caught a 46-yard touchdown from Kyron Rogers with 10:29 left in the game. Pannell had 105 yards rushing on nine carries, Rogers went 11-for-15 for 141 yards and Penn led with 52 yards receiving. Nathan Lawyer added a 1-yard touchdown run on 4th-and-goal for the Eagles (0-3) with 1:58 left in the third. Next up, BW returns home to face a familiar old OCC-Capital rival Olentangy Orange in non-league. Kickoff is set for 7 p.m.
Brody Kannally scored a goal in each half and Briggy Kannally added one of his own to lead Delaware Hayes to a non-league win over Beechcroft Thursday night. Sam Green added an assist in the win. Also: Pleasant 3, Delaware Christian 0. Buckeye Valley blanked Ready Thursday, getting a pair of first-half goals from Faith Durbin to set the tone. Ellen Riley also scored in the first half as the Barons rolled to a 3-0 lead by the break. Jillian Hon, Daelynn Rosser, Hannah Cowan and Megan Hon added second-half tallies to smooth out the scoring summary. Cami Crawford and Liz Gedde had three saves apiece in the BV goal. Olivia Neidhardt, Natalie Hegg and Kayla Primm found the back of the net as the Braves rolled to a 3-1 non-league win over New Albany Thursday night. Mckinley Hoffman had 10 saves in the Olentangy goal. Orange 149, Upper Arlington 161. Big Walnut 5, Groveport 0. Olentangy Liberty 3, Westerville South 0; Olentangy 3, Westerville North 1; Hayes 3, Dublin Jerome 1. Big Walnut’s Eli Myers knocks the ball away from Dublin Scioto quarterback Kyron Rogers during the first half of Thursday’s non-league showdown in Dublin. The Golden Eagles recovered the fumble, one of eight the teams combined for in the first half alone. https://www.delgazette.com/wp-content/uploads/sites/40/2017/09/web1_bwfumble-2.jpgBig Walnut’s Eli Myers knocks the ball away from Dublin Scioto quarterback Kyron Rogers during the first half of Thursday’s non-league showdown in Dublin. The Golden Eagles recovered the fumble, one of eight the teams combined for in the first half alone.